In some of your assignments, you might need to use text boxes within Microsoft Word and Microsoft PowerPoint. Text boxes are squares which you can insert into your document. You can then add text in them. You can change the size/colour/font of your text, you can change the inner colour of the square, and you can change the colour of its outline. Here’s a quick guide on how to do all this. In your document, click at the point where you’d like to add a text box. In the top tools bar, select Insert, then Shapes. Select Text Box (it’s the first option in the section Basic Shapes). Go back to your document, and drag/drop your mouse pointer to ‘draw‘ the box. To resize it, ‘grab’ it with your mouse from any of the little circle points around it, and drag it. To change the inner or outline colour of the box, click once on the outline of the box. Then in the top tools bar, select Format. Then play around with the Shape Fill or the Shape Outline colours. To add text, click once inside the box and type (or paste). To change the appearance of text, select the text and edit it as you normally would (make sure you’re in the Home section at the top tools bar). WizIQ is an online easy to use webinar hosting platform. Read carefully through this Webinar Preparation Guide and ensure you meet all requirements, pass all tests and obtain a score of 3.0/5.0 or above. You should run the Pre-Call Test in order to confirm your call quality before joining each webinar. You will receive an email from WizIQ asking you to set your password. Password must be set within 48 hours of receiving the email – otherwise you must sign up via https://webinars.montessori.org.uk/. Join a session by clicking on the link you’ll find on the relevant VLE section. If you’re not registered yet, you’ll be asked to do so as soon as you click on the link. Register and sign in – then click on menu at top left (three parallel horizontal lines), select Live Classes, then select your class. This will take you to the Webinar Launch page. Click Launch to start. When prompted by a pop-up box, click Allow Access. Your camera, microphone, and sharing functions are disabled by default. We will activate them as and when the course requires. To tell us about any technical issues you might be having, type in the chat box at bottom left (either in public view in Classroom Conversation, or privately in Private Messages). To ask a question related to the session, click on the raising hand icon and type in what your question is about (you don’t have to type the full question). Then “wait for acknowledgment” and we’ll unmute you so that we can discuss your query. FAQ: How can I view Moodle notifications on Moodle? Moodle notifications could be news forum posts, submission confirmation emails or other academic forums posts you are subscribed to. You can check every notification on moodle. FAQ: How do I access my Moodle messages on Moodle? You might receive a ‘moodle message’ from another user. These messages are forwarded to you via email, but you can also access them on the moodle platform. SHARE YOUR PROFILE: Go to My Account > My Profile. Click on the Share icon on the right of your profile image. Enter your tutor’s email in the next pop-up window, and click Share. SHARE YOUR PORTFOLIO: Hover over your portfolio and click Share, or click and enter your portfolio and click Share. In the next pop-up window, click on the SHARE small button (it’s got an envelope to its left). Enter your tutor’s email in the next pop-up window, and click Share. See the table below to find out what to share, who with, and when. Please note: only share your Profile and your Portfolios with tutors. There’s no need to share with them each individual document you upload! item to share who with? when? your profile your tutor or the group address (as instructed during induction) straight away! your personal development portfolio your tutor or the group address (as instructed during induction) straight away! Please view our Pathbrite FAQs for further tips, e.g. how to re-share or un-share your Pathbrite e-portfolio. You’ll find it in the Resources section of your course on the Moodle VLE. 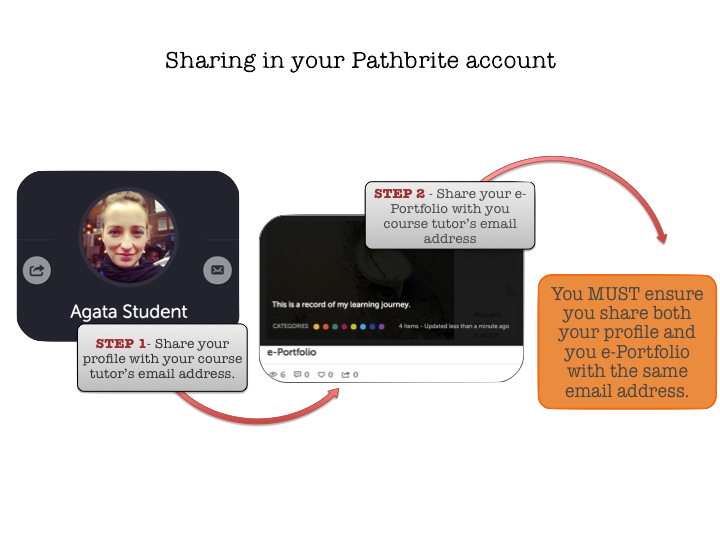 You will of course keep adding documents to your portfolios throughout your studies, however the above document needs to be completed and uploaded onto Pathbrite at the very beginning of your course. Click and enter a portfolio and then click on the Edit button at the top right. Either drag and drop files from your computer into the central upload box, or click on Add Work on the menu on the right and select what type of document you’d like to upload. If you don’t like the way a document appears on your portfolio ‘wall’: click and enter your portfolio, then click on Edit. Find your document, hover over it, and click on Adjust Image. Then follow the instructions to add your own ‘cover’ of the item. Click and enter your portfolio. Click on Edit at top right. Scroll down, find the document you want to delete, and click on the Bin icon on the document (at the top right of the document).